The history of the South Hants Model Railway Club can be traced to the Portsmouth Railway Circle, which was formed in 1948. For many years, it met in Great Salterns Mansion on the Eastern Road in the guise of the Portsmouth and South Hants Railway Club before moving to new clubrooms at Fort Widley to the North of Portsmouth. Our club is a very active one with a continuing programme of layout construction, exhibiting club and member layouts, demonstrating at exhibitions around the country and, of course, holding our own annual exhibition every November.The club currently in excess of 30 members from a wide geographic area with members from Romsey, Southampton and West Sussex, as well as the odd one or two from Portsmouth! The normal club night is Thursday from about 8pm although the clubrooms, where we have exclusive use of two large rooms, are available for members to use at other times. The club is very friendly and we like to feel it is easy for new members to quickly “feel at home”. There is the chance to contribute to any project (or projects if you wish) and the opportunity to learn (or to teach!) and to exchange ideas with other members. Club meetings usually end with a visit to a local pub for those who are that way inclined – generally most of us! We feel our club is something special. We don’t expect all our members to be expert modellers (although some certainly are) but we constantly strive to improve our own standards and try to encourage everyone to “have a go”. If you think our club would suit you, why not come up and see us one Thursday evening. We are always quite happy to entertain guests and prospective members. We hold an annual exhibition in November. We believe that our exhibition genuinely does show off railway modelling at its best. The show has a definite finescale slant although the main criterion is top class model making. In short, we try to put on the sort of exhibition we would travel to see. Click here to go to the Exhibition pages. One of the major club activities is building and exhibiting layouts and you will find information about these elsewhere on the web site. In addition, a number of members have layouts that are frequent visitors to exhibitions. These are also featured here. 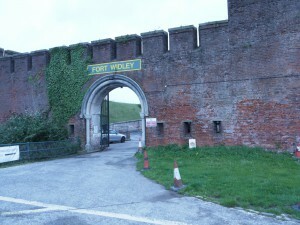 One of a line of forts overlooking Portsmouth and its harbour and collectively known as ‘Palmerston’s Folly’, Fort Widley was completed in 1870 at a cost of £94,000. The forts are on the crest of Portsdown Hill, overlooking Portsmouth and its harbour. They face inland, which to some people looks the wrong way. Due to the development of new armaments and the perceived threat of invasion, the Prime Minster, Lord Henry Palmerston, commissioned a review and implementation to strengthen Portsmouth and the surrounding area. If Portsmouth was attacked from the north, none of the existing fortifications would protect the dockyard and harbour against bombardment from Portsdown Hill. Deep within the bowels of the fort, near the entrance to one of its extensive underground passages, are our clubrooms. We are proud to be associated with the Peter activity Centres which are based in Fort Purbrook and Fort Widley, just north of Portsmouth. They are a registered charity providing and enabling a wide range of sports and activities. The centres provide a fantastic mix of physical and academic activities including: Archery, Air Rifle shooting, Assault Courses, Climbing, Horse Riding, Initiative Tests, Holiday Activities, and Team Building. Click here to visit the Peter Ashley website. Our annual exhibition is fast approaching. It is on 17 November at the Admiral Lord Nelson school and we look forward to seeing you there.